I'm sure you have seen this dress over and over all over blogs and Instagram, and there is a good reason for it...IT GOES WITH EVERYTHING! I have worn this with heels and statement earrings to nice dinner, with my white converse and a baseball hat to brunch and with summery accessories -like on this post - for the weekend. This is the Katie Fisherman bag from Tory Burch from her Spring 2013 collection. It was a birthday gift from my sister a couple years ago and I LOVE IT. It fits a decent amount of items and gives so much color and personality to any outfit. These wedges are also incredibly versatile, I also wore them on this post. They are a very comfortable all-day shoe. I added a pop of color to my fave with Nars Heat Weave over my Caudalie lip conditioner. Heat Wave is a little bit on the dryer side so I always apply a lip balm before to make it smoother. Hey Nicole! You look great and that wall is amazing. You are rocking the off the shoulder trend like a pro!! Love how you styled the dress, especially that fab bday bag! 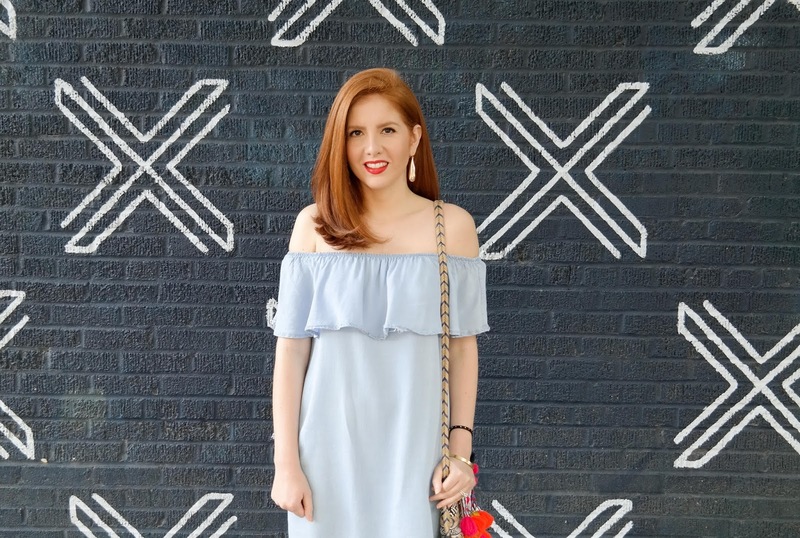 Such a GORGEOUS chambray dress - you look incredible! And that bag?!? #swooning <3. Beautiful post! This is such a beautiful chambray dress! Love it so much! Love that bag SO so much! It's perfect for summer, and LOVE it with that outfit girl. That bag is so gorgeous!!! Love the entire look!! I saw this on your instagram and fell instantly in love! This dress is beyond gorgeous! I love it!